OSHA also wasn't established until the year this movie was made. @Dillusionist, Coincidence? I think not! @Dillusionist, and what do you know! OSHA is still part of the US department of labor so the British chocolate factory is still ok on that front. @Gallium , clearly the Wonka factory exists in all of our hearts, not a nation. @Dillusionist, my bad! I forgot to found osha in my heart all together, those poor cardiovascular workers. 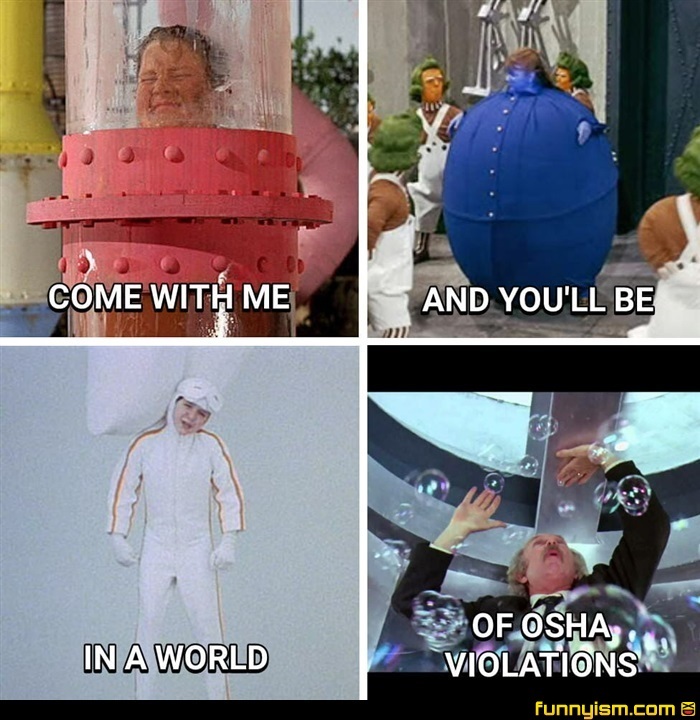 @Dillusionist, "you stole fizzy lifting drinks, you lose, you get NOTHING"
@Seohn, I had the first half of the parody lyrics in my head when A meme involving Wonka popped up several months ago. This one inspired the rest of it. Have you ever wondered if Oompa Loompas have Union rights? @Sam da ram, They don’t even get dental. @CRIZZLE290, they don't have dental!? Notice his factory wasn't in America for a reason. This was stolen from honest Movie Trailers. Google it. It's worth it.